One of the most important things to remember when your Mac hard drive breaks down is that typically, even if your machine is still under warranty, Apple is very unlikely to provide you with warranty service that includes full data recovery. Many of our customers come to us after discovering that an Apple technician attempted to replace their hard drive without actually retrieving the data that was stored on the original broken hard disk. This is actually quite a common practice, unfortunately, and is not something that occurs with Apple alone. Apple Mac computers have always been a key data recovery focus for our company, and this is an important factor for people looking to recover their Mac hard drives. When looking for a Mac data recovery service, make sure that you are contacting a company with a broad array of experience with Apple machines. Although Macs have typically been less subject to catastrophic hard drive failure than Windows PCs, this is a situation that does occur more and more as the systems have become more mainstream. Unfortunately, a mechanical hard drive crash on a Mac computer can sometimes be much more difficult to deal with than a comparable crash on a Windows system. The Mac file system is quite different than the Windows NTFS file system, and many data recovery service companies are not used to the differences. You should always make sure that you are dealing with a very experienced Mac hard drive recovery technician when you are trying to recover the data from a failed Mac hard drive, as an inexperienced engineer may put your data at risk. Also, ensure that the data recovery service you are dealing with has been certified to work on Apple hard drives – not all shops are, but it’s a distinction that will be critical to your data’s safety. One of the pieces of advice we give to both Windows PC and Mac users is that if you hear a clicking or buzzing sound coming from your computer case, it is always better to shut the computer down and ask for help. One of the best things about the data recovery service industry in general is that the smart vendors will always provide free technical support to users that may have experienced hard drive failure – it just makes good business sense. So never feel like you shouldn’t call a data recovery service first – there is never an obligation, and it can save you a lot of problems in the future. 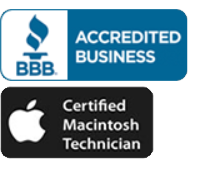 Contact us here for a free evaluation of your Mac hard drive problem.